J. Herman Blake and family drew cheers and fond recollections at event renaming Oakes Provost House in his honor. Podcast: J. Herman Blake, the founding provost of Oakes College, shares his memories of life at UC Santa Cruz. Audries Blake shared fond recollections of life at the Oakes Provost House in front of a rapt crowd. Founding Oakes College Provost J. Herman Blake had a warm homecoming recently at UC Santa Cruz when he was the guest of honor in a ceremony rededicating the Oakes Provost House and naming it after Blake. Listen to the podcast. 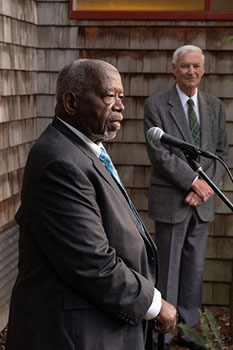 An enthusiastic crowd of 200 people were on hand to cheer Blake, who heard testimonials from current Oakes Provost Regina Langhout; UC Santa Cruz Chancellor George Blumenthal; and emeritus biology professor William T. Doyle, a faculty member when the campus opened in 1965. Doyle suggested the name change and is funding all related expenses. Blake started at UC Santa Cruz in 1966 when he accepted an offer to join as a professor of sociology. Six years later he became Oakes’s founding provost. Along with a team of forward-thinking colleagues, including Oakes cofounder Rafael Guzman, he helped the college set forth on the path it follows to this day, with a strong emphasis on inclusion and academic excellence. He placed significant value on mentorship and promoting the sciences among underrepresented students. Blake remained the provost of Oakes until 1984, when he left to become president of Tougaloo College. 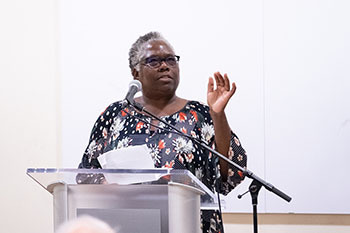 After the renaming ceremony, one of Blake’s daughters, Audries Blake, now the assistant director for the Center for Agroecology and Sustainable Food Systems (CASFS) at UC Santa Cruz, shared fond recollections of the provost house.